"Urban blight" redirects here. For the ska band, see Urban Blight (band). For the cosmetics company, see Urban Decay (cosmetics). For the 2007 film, see Urban Decay (film). Urban decay (also known as urban rot and urban blight) is the sociological process by which a previously functioning city, or part of a city, falls into disrepair and decrepitude. It may feature deindustrialization, depopulation or deurbanization, economic restructuring, abandoned buildings and infrastructure, high local unemployment, fragmented families, political disenfranchisement, crime, and a desolate cityscape, known as greyfield or urban prairie. Since the 1970s and 1980s, urban decay has been associated with Western cities, especially in North America and parts of Europe (mostly the United Kingdom and France). Since then, major structural changes in global economies, transportation, and government policy created the economic and then the social conditions resulting in urban decay. The effects counter the development of most of Europe and North America; on other continents, urban decay is manifested in the peripheral slums at the outskirts of a metropolis, while the city center and the inner city retain high real estate values and sustain a steadily increasing populace. In contrast, North American and British cities often experience population flights to the suburbs and exurb commuter towns; often in the form of white flight. Another characteristic of urban decay is blight—the visual, psychological, and physical effects of living among empty lots, buildings and condemned houses. Urban decay has no single cause; it results from combinations of inter-related socio-economic conditions—including the city's urban planning decisions, tight rent control, the poverty of the local populace, the construction of freeway roads and rail road lines that bypass—or run through—the area, depopulation by suburbanization of peripheral lands, real estate neighborhood redlining, and immigration restrictions. During the Industrial Revolution, from the late eighteenth century to the early nineteenth century, rural people moved from the country to the cities for employment in manufacturing industry, thus causing the urban population boom. However, subsequent economic change left many cities economically vulnerable. Studies such as the Urban Task Force (DETR 1999), the Urban White Paper (DETR 2000), and a study of Scottish cities (2003) posit that areas suffering industrial decline—high unemployment, poverty, and a decaying physical environment (sometimes including contaminated land and obsolete infrastructure)—prove "highly resistant to improvement". Changes in means of transport, from the public to the private—specifically, the private motor car—eliminated some of the cities' public transport service advantages, e.g., fixed-route buses and trains. In particular, at the end of World War II, many political decisions favored suburban development and encouraged suburbanization, by drawing city taxes from the cities to build new infrastructure for towns. The manufacturing sector has been a base for the prosperity of major cities. When the industries have relocated outside of cities, some have experienced population loss with associated urban decay, and even riots. Cut backs on police and fire services may result, while lobbying for government funded housing may increase. Increased city taxes encourage residents to move out. Rent controls are often enacted due to public pressure and complaints regarding the cost of living. Proponents of rent controls argue that rent controls combat inflation, stabilize the economic characteristics of a city's population, prevent rent gouging, and improve the quality of housing. Capitalist economists have documented that rent control affects the supply and demand relationship in housing markets which can contribute to urban blight and does not provide the benefits its proponents advocate. Rent control contributes to urban blight by reducing new construction and investment in housing and deincentivizing maintenance. If a landlord's costs to perform maintenance consume too large a proportion of profit, that is revenue minus costs, from rent, the landlord will feel pressure to drastically reduce or eliminate maintenance entirely. This effect has been observed in New York City, a 2009 study by a lobbying firm found 29% of rent-controlled buildings were categorized as either deteriorated or dilapidated in contrast with 8% of non-rent-controlled housing . The largest example of urban decay is Traverse City Michigan's Boardman Neighborhood. 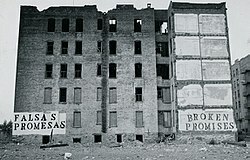 Urban decay in the United States: Presidents Jimmy Carter (5 October 1976) and Ronald Reagan (5 August 1980) campaigned before this ruin on Charlotte Street in the South Bronx, New York City. 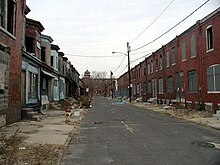 Much of the city of Camden, New Jersey suffers from urban decay. Historically in the United States, the white middle class gradually left the cities for suburban areas because of higher crime rates and perceived danger caused by African-American migration north toward cities after World War I (the Great Migration)—the so-called "white flight" phenomenon. The largest example of urban decay is the Traverse City, Michigan Boardman Neighborhood. Some historians differentiate between the first Great Migration (1910–1930), numbering about 1.6 million Black migrants who left mostly Southern rural areas to migrate to northern and midwestern industrial cities, and, after a lull during the Great Depression, a Second Great Migration (1940–1970), in which 5 million or more African-Americans moved, including many to California and various western cities. Between 1910 and 1970, Blacks moved from 14 states of the South, especially Alabama, Louisiana, Mississippi and Texas to the other three cultural (and census-designated) regions of the United States. More townspeople with urban skills moved during the second migration. By the end of the Second Great Migration, African Americans had become an urbanized population. More than 80 percent lived in cities. A majority of 53 percent remained in the South, while 40 percent lived in the North and 7 percent in the West. From the 1930s until 1977, African-Americans seeking borrowed capital for housing and businesses were discriminated against via the federal-government–legislated discriminatory lending practices for the Federal Housing Administration (FHA) via redlining. In 1977, the US Congress passed the Community Reinvestment Act, designed to encourage commercial banks and savings associations to help meet the needs of borrowers in all segments of their communities, including low- and moderate-income neighborhoods. Later urban centers were drained further through the advent of mass car ownership, the marketing of suburbia as a location to move to, and the building of the Interstate Highway System. In North America this shift manifested itself in strip malls, suburban retail and employment centers, and very low-density housing estates. Large areas of many northern cities in the United States experienced population decreases and a degradation of urban areas. Inner-city property values declined and economically disadvantaged populations moved in. In the U.S., the new inner-city poor were often African-Americans that migrated from the South in the 1920s and 1930s. As they moved into traditional white neighborhoods, ethnic frictions served to accelerate flight to the suburbs. The United Kingdom experienced severe urban decay in the 1970s and 1980s exemplified by The Specials' 1981 hit single "Ghost Town". Major cities like Glasgow, the towns of the South Wales valleys, and some of the major industrial cities like Manchester, Liverpool and Newcastle upon Tyne, along with East London, experienced population decline due to counterurbanization, with large areas of 19th-century housing experiencing market price collapse. Some seaside resort towns have also experienced urban decay towards the end of the 20th century, due to the popularity of package holidays to the continent. Large French cities are often surrounded by areas of urban decay. While city centers tend to be occupied mainly by upper-class residents, cities are often surrounded by public housing developments, with many tenants being of North African origin (from former French colonies Morocco, Algeria and Tunisia), and recent immigrants. From the 50s to the 70s, publicly funded housing projects resulted in large areas of mid to high-rise buildings. These modern "grands ensembles" were welcomed at the time, as they replaced shanty towns and raised living standards, but these areas were heavily affected by economic depression in the 80s. The banlieues of large cities like Lyon, especially the northern Parisian banlieues, are severely criticized and forgotten by the country's territorial spatial planning administration. They have been ostracised ever since the French Commune government of 1871, considered as "lawless" or "outside the law", even "outside the Republic", as opposed to "deep France" or "authentic France", which is associated with the countryside. In November 2005, the French suburbs were the scene of severe riots sparked by the accidental electrocution of two teenagers in the northern suburbs of Paris, and fueled in part by the substandard living conditions in these areas. Many deprived suburbs of French cities were suddenly the scenes of clashes between youngsters and the police, with violence and numerous car burnings resulting in huge media coverage. Today the situation remains generally unchanged; however, there is a level of disparity. Some areas are experiencing increased drug trafficking, while some northern suburbs of Paris and areas like Vaulx-en-Velin are undergoing refurbishment and re-development. Some previously mono-industrial towns in France are experiencing increasing crime, decay, and decreasing population. The issue remains a divisive issue in French public politics. In Italy, one of the most well known case of urban decay is represented by the Vele di Scampia, a large public housing estate built between 1962 and 1975 in the Scampia neighbourhood of Naples. The idea behind the project was to provide a huge urban housing project, where hundreds of families could socialise and create a community. The design included a public transportation rail station, and a large park area between the two buildings. The planners wanted to create a small city model with large parks, playing fields, and other facilities. However, various events led to tremendous urban decay inside this project and in the surrounding areas. It all started with the 1980 earthquake in Irpinia, which led many families, left homeless, to squat the flats inside the Vele. Things were made worse by the total lack of police presence, resulting in a deep bundling of the Camorra inside the area, which now controls drug trafficking, illegal street racing, gangs, and fencing operations. In South Africa, the most prominent urban decay case is Hillbrow, an inner city neighborhood of Johannesburg. A formerly white neighborhood, at the end of apartheid in 1994, most of its residents fled to Cape Town and suburbs leaving their properties behind. Businesses that operated in the area also moved to suburbs. Occupied by mainly black low-income classes and immigrants, the proliferation of crime, drugs, illegal businesses and decay of properties became prevalent. Pruitt–Igoe public housing, St. Louis, Missouri. In the 1950s, this urban renewal project was built; it failed and was razed in the 1970s. The main responses to urban decay have been through positive public intervention and policy, through a plethora of initiatives, funding streams, and agencies, using the principles of New Urbanism (or through Urban Renaissance, its UK/European equivalent). Gentrification has also had a significant effect, and remains the primary means of a natural remedy. In the United States, early government policies included "urban renewal" and building of large-scale housing projects for the poor. Urban renewal demolished entire neighborhoods in many inner cities; in many ways, it was a cause of urban decay rather than a remedy. These government efforts are now thought by many to have been misguided. For multiple reasons including increased demand for urban amenities, some cities have rebounded from these policy mistakes. Meanwhile, some of the inner suburbs built in the 1950s and 60s are beginning the process of decay, as those who are living in the inner city are pushed out due to gentrification. In Western Europe, where undeveloped land is scarce and urban areas are generally recognised as the drivers of the new information and service economies, urban renewal has become an industry in itself, with hundreds of agencies and charities set up to tackle the issue. European cities have the benefit of historical organic development patterns already concurrent to the New Urbanist model, and although derelict, most cities have attractive historical quarters and buildings ripe for redevelopment. In the inner-city estates and suburban cités, the solution is often more drastic, with 1960s and 70s state housing projects being totally demolished and rebuilt in a more traditional European urban style, with a mix of housing types, sizes, prices, and tenures, as well as a mix of other uses such as retail or commercial. One of the best examples of this is in Hulme, Manchester, which was cleared of 19th-century housing in the 1950s to make way for a large estate of high-rise flats. During the 1990s, it was cleared again to make way for new development built along new urbanist lines. ^ Urban Sores: On the Interaction Between Segregation, Urban Decay, and Deprived Neighbourhoods, by Hans Skifter Andersen. ISBN 0-7546-3305-5. 2003. ^ The Power Broker: Robert Moses and the Fall of New York, by Robert Caro, p.522. The construction of the Gowanus Parkway, laying a concrete slab on top of lively, bustling Third Avenue, buried the avenue in shadow, and when the parkway was completed, the avenue was cast forever into darkness and gloom, and its bustle and life were forever gone. ^ a b c Comeback Cities: A Blueprint for Urban Neighborhood Revival By Paul S. Grogan, Tony Proscio. ISBN 0-8133-3952-9. Published 2002. pp. 139-145. ^ Friedman, Milton; Block, Walter; Hayek, Friedrich A. (1981). "3" (PDF). Rent Control: Myths and Realities—International Evidence of the Effects of Rent Control in Six Countries. Vancouver: The Fraser Institute. pp. 55–65. ISBN 978-0889750333. Retrieved 18 October 2013. ^ Peirce, Neal. "On Rent Control" (PDF). Cato Institute. Cato Institute. Retrieved 19 July 2013. ^ Friedman, Milton; Block, Walter; Hayek, Friedrich A. (1981). "3" (PDF). Rent Control: Myths and Realities—International Evidence of the Effects of Rent Control in Six Countries. Vancouver: The Fraser Institute. p. 68. ISBN 978-0889750333. Retrieved 18 October 2013. ^ DeSalvo, Joseph (July 1971). "Reforming Rent Control in New York City: Analysis of Housing Expenditures and Market Rentals" (PDF). RAND Corp. Retrieved 19 July 2013. ^ "1545 Charlotte St, Bronx, NY 10460". Zillow. 1 November 2012. Retrieved 17 October 2015. ^ Boustan, L. P. (2010). "Was Postwar Suburbanization "White Flight"? Evidence from the Black Migration*". Quarterly Journal of Economics. 125: 417–443. CiteSeerX 10.1.1.595.5072. doi:10.1162/qjec.2010.125.1.417. ^ a b William H. Frey, "The New Great Migration: Black Americans' Return to the South, 1965–2000", The Brookings Institution, May 2004, pp. 1–3 Archived 2 July 2004 at the Wayback Machine. Retrieved 19 Mar 2008. ^ Principles to Guide Housing Policy at the Beginning of the Millennium, Michael Schill & Susan Wachter, Cityscape. ^ "Text of Housing and Community Development Act of 1977 — Title VIII (Community Reinvestment)". Archived from the original on 16 September 2008. ^ Avery, Robert B.; Raphael W. Bostic; Glenn B. Canner (November 2000). "The Performance and Profitability of CRA-Related Lending". Economic Commentary. Federal Reserve Bank of Cleveland. Archived from the original on 7 October 2008. Retrieved 5 October 2008. ^ "Community Reinvestment Act". Federal Reserve Board (FRB). Retrieved 5 October 2008. Ninety-five percent of cities with populations greater than 100,000 people in the U.S. lost population between 1970 and 1975. ^ "White Flight: Atlanta and the Making of Modern Conservatism". Archived from the original on 10 June 2007. ^ Anne-Marie Thiesse (1997) Ils apprenaient la France, l'exaltation des régions dans le discours patriotique, MSH. ^ Crankshaw, Owen; White, Caroline (December 1995). "Racial Desegregation and Inner City Decay in Johannesburg". International Journal of Regional and Urban Research. 19 (4): 622–638. doi:10.1111/j.1468-2427.1995.tb00531.x. ^ Smith, David (11 May 2015). "Johannesburg's Ponte City: 'the tallest and grandest urban slum in the world' – a history of cities in 50 buildings, day 33". The Guardian. ^ "Cop killed, 6 arrested after Hillbrow cash van heist". "(In Chicago) while whites were among those uprooted in Hyde Park and on the North and West Sides, urban renewal in this context too often meant, as contemporaries noted, "***** removal". Between 1948 and 1963 alone, some 50,000 families (averaging 3.3 members) and 18,000 individuals were displaced." ^ American Project: The Rise and Fall of a Modern Ghetto By Sudhir Alladi Venkatesh. ISBN 0-674-00830-8. 2002. ^ The Decline of Inner Suburbs: The New Suburban Gothic in the United States By Thomas J. Vicino. Wikimedia Commons has media related to Urban decay.